When people think of sublimation, most probably think of mugs or t-shirts or mousepads. I’m guessing many people don’t even know that shot glasses can be sublimated. Today I wanted to rectify that situation and give you all a short lesson in how to create your own sublimated shot glasses. The first thing you need assuming, of course, that you already have all the equipment and supplies necessary for printing sublimation transfers, is a sublimatable shot glass. EnMart carries a lovely 1.5 ounce version with a gold rim, the perfect size for a shot of your favorite tequila or a premium liqueur. Once you have your shot glasses you need to create your artwork and print it onto your sublimation paper. The transfers can be secured to your shot glass with some heat tape. Unlike many sublimatable items, shot glasses cannot be sublimated using a heat press. They are too small and fragile to withstand the pressure and weight of a press. Instead of a press, shot glasses are sublimated using an oven and something called a shot glass wrap. A shot glass wrap is a small piece of rubber like material that fits snugly around the body of the shot glass, holding the transfer in place against the substrate. Once your wrap is secured, place your shot glass in an oven that has been preheated to 400 degrees. The shot glass should stay in the oven for 15 to 20 minutes. You may do multiple shot glasses at one time. The number, of course, will be limited by the size of your oven. Please keep in mind that some experimentation may be necessary to find the appropriate time and temperature combination for your particular oven model and the number of shot glasses you wish to sublimate at one time. Please also keep in mind that the oven where you cook your food should probably not be the same oven in which you do sublimation. Once the time is up, carefully remove the shot glass from the oven with a hot pad or oven mitt. Remove the wrap and the used transfer from the shot glass. Generally, shot glasses should be either air cooled using a fan or placed on a rack to cool gradually. A quick cooling could cause your shot glasses to shatter, so it is recommended that you let them cool over time. Once your shot glass is cooled, you may want to give it a quick wash before you use it. Ceramic shot glasses that are orca coated may be dishwasher safe, but any other sort of shot glass should be washed by hand. You use a template curved so that it will fit the tapered shape once it is cut and taped onto the shot glass. When you put the image inside it, then print, cut, and wrap it around the shot glass, it will conform to fit the glass. 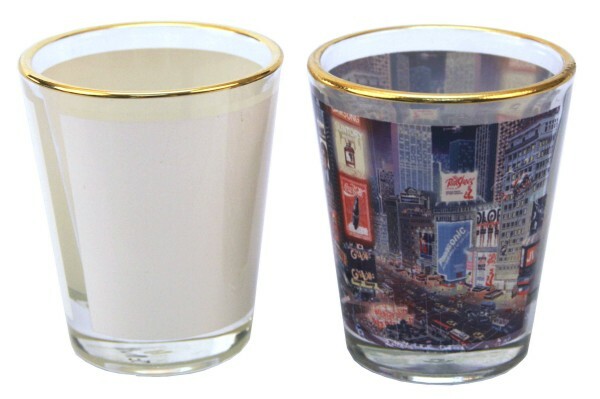 Here is a link to the template file and additional instructions for our shot glasses on our web site: http://www.myenmart.com/sublitemplates/shotglass.pdf. Anything you sublimate has to be poly coated. There are glass items, beer mugs are one we carry, that are coated appropriately and can be sublimated. Sublimation does require a poly coating, so you can’t just sublimate any type of glass item. It needs to be specifically prepared for sublimation.